Research Interests: Applied Econometrics, Industrial Relations, Labour Economics, Personnel economics. Short Bio: I am Professor of Economics at the Université libre de Bruxelles (ULB), a Research Fellow of the Centre Emile Bernheim (CEB), the Department of Applied Economics of ULB (DULBEA) and the Institute for the Study of Labor (IZA), and a Research Associate of the Institut de Recherche en Développement Humain et des Organisations (humanOrg) at the Université de Mons (UM) and of the Institut de Recherches Economiques et Sociales (IRES) at the Université Catholique de Louvain (UCL). I obtained my Ph.D. in Economics in 2001 from the ULB. My research is in the area of empirical labour economics, in particular the analysis of matched employer-employee data and the determinants of earnings inequality and firm productivity. I do also research on the economics of trade unions, education economics, income inequality, minimum wages, and personnel economics. I advised various organizations including the European Central Bank, Eurofound, the European Trade Union Institute, IWEPS, the National Bank of Belgium, the European Commission and the OECD. I co-edited several books (Palgrave) and special issues of scientific journals, and published in Applied Economics, Applied Economics Quarterly, British Journal of Industrial Relations, De Economist (Netherlands Economic Review), Economics of Education Review, Economics of Transition, Empirica, European Journal of Industrial Relations, Industrial and Labor Relations Review, Industrial Relations: A Journal of Economy and Society, International Journal of Manpower, IZA Journal of Development and Migration, IZA Journal of Labor Economics, IZA Journal of Labor Policy, Journal of Financial Stability, Journal of Sports Economics, Kyklos, LABOUR: Review of Labour Economics and Industrial Relations, Regional Studies, Review of International Economics, Review of World Economics, The Manchester School, Scottish Journal of Political Economy, Socio-Economic Review and other journals. I am a member of the Editorial Advisory Board of the International Journal of Manpower and has been a co-Editor of the Brussels Economic Review. I am visiting professor at UCL. "Over-education According to Workers' Country of Birth: The Role of Workers' Characteristics" (with B. Mahy, V. Jacobs and M. Volral). "Wage Discrimination Against Migrants: How Much Do Country of Birth and Product Market Competition Matter?" (with V. Fays, B. Mahy and M. Volral). This paper received the prize of the "Journée de la Recherche 2018" awarded by the Fédération Wallonie-Bruxelles to V. Fays. "A Bigger House at the Cost of an Empty Fridge?" (with P. du Caju, G. Perilleux and I. Tojerow). "Loan-to-Value Ratios, Mortage Over-indebtedness and Financial Stability" (with P. du Caju and I. Tojerow). "Employment Outcomes of First- and Second-generation Immigrants in Belgium" (with C. Piton). "First-generation Immigrants' Wage Penalty: Does Rent-sharing Matter?" (with M. Volral and A. Warocquier). "Overeducation, Overskilling and Job Satisfaction: The Moderating Role of Labour Contracts" (with R. Giuliano, B. Mahy and G. Vermeylen). Productivité et salaires des 'groupes à risque' en Belgique, Reflets et Perspectives de la vie économique, Vol. LV, No. 4, pp. 5-104, 2016 (co-edited with B. Mahy and V. Vandenberghe). (Mis)Alignment of Productivity and Wages: Firm-level Evidence, International Journal of Manpower, special issue, Vol. 37, No. 2, pp. 197-392, 2016 (co-edited with J. Konings and V. Vandenberghe). Work Organization, Performance and Health, International Journal of Manpower, special issue, Vol. 33, No. 3, pp. 224-339, 2012 (co-edited with G. Citoni and B. Mahy). Wage Structures, Employment Adjustments and Globalisation: Evidence from Linked and Firm-level Panel Data, Applied Econometrices Association Series, Palgrave Macmillan, 288p., 2010 (co-edited with D. Marsden). Unemployment, Innovation and R&D, International Journal of Manpower, special issue, Vol. 29, No. 3, pp. 192-298, 2008 (co-edited with A. Garofalo and C.P. Vinci). Pratiques dans les entreprises et marché du travail, Reflets et Perspectives de la vie économique,double special issue, Vol. XLVI, No. 2/3, pp. 3-153, 2007 (co-edited with B. Mahy and R. Plasman). Labour Contracts, Wages and Employment, International Journal of Manpower, special issue, Vol. 28, No. 7, pp. 531-650, 2007 (co-edited with C. Altavilla and B. Mahy). Gender Pay Differentials: Cross-National Evidence from Micro-Data, Applied Econometrices Association Series, Palgrave Macmillan, p. 224, 2006 (co-edited with B. Mahy and R. Plasman). HRM and Job Performance Incentives, International Journal of Manpower, double special issue, Vol. 26, No. 7/8, pp. 613-746, 2005 (co-edited with B. Mahy and R. Plasman). Labour Market Polarization, Brussels Economic Review, double special issue, Vol. 48, No. 1/2, pp. 5-206, 2005 (co-edited with B. Mahy and R. Plasman). Economie de la demande de travail, Reflets et Perspectives de la vie économique, special issue, Vol. XLIII, No. 2, pp. 3-107, 2005 (co-edited with B. Mahy and R. Plasman). Minimum Wages, Low Pay and Unemployment, Applied Econometrices Association Series, Palgrave Macmillan, p. 248, 2004 (co-edited with D. Meulders and R. Plasman). Earnings Inequalities: Gender, Race and Sexual Orientation, International Journal of Manpower, double special issue, Vol. 25, No. 3/4, pp. 239-377, 2004 (co-edited with D. Meulders and R. Plasman). Competitive versus Non Competitive Wage Differentials, International Journal of Manpower, special issue, Vol. 24, No. 4, pp. 323-491, 2003 (co-edited with D. Meulders and R. Plasman). Gender Wage Gaps: A European Perspective, Brussels Economic Review, special issue, Vol. 45, No. 2, pp. 2-246, 2002 (co-edited with D. Meulders and R. Plasman). "Does Corporate Social Responsibility Make Over-educated Workers More Productive ? ", Applied Economics, Vol. 49, No. 6, pp. 587-605, 2017 (with R. Giuliano, B. Mahy and G. Vermeylen). "Are Workers Less Absent When Wage Dispersion Is Small ? ", International Journal of Manpower, Vol. 37, No. 2, pp. 197-209, 2016 (with B. Mahy and M. Volral). "Wage Discrimination Against Immigrants: Measurement With Firm-level Productivity Data", IZA Journal of Development and Migration (*), Vol. 5, No. 15, pp. 1-24, 2016 (with S. Kampelmann). [See also IZA DP] (*) Formerly IZA Journal of Migration. "(Mis)Alignment of Productivity and Wages: Firm-level Evidence", International Journal of Manpower, Vol. 37, No. 2, 2016 (with J. Konings and V. Vandenberghe). "Productivity, Wages and Profits Among Belgian Firms: Do Fixed-term Contracts Matter ? ", International Journal of Manpower, Vol. 37, No. 2, pp. 303-322, 2016 (with A. Garnero, B. Mahy and R. Giuliano). "The Heterogeneous Effects of Workplace Diversity on Productivity, Wages and Profits", Industrial Relations: A Journal of Economy and Society, Vol. 53, No. 3, pp. 430-477, 2014 (with A. Garnero and S. Kampelmann). [See also RePEc] Featured in La Tribune and Le Monde. "Rent Sharing under Different Bargaining Regimes: Evidence from Linked Employer-Employee Data", British Journal of Industrial Relations, Vol. 51, No. 1, pp. 28-58, 2013 (with M. Rusinek). "Work Organization, Performance and Health", International Journal of Manpower, Vol. 33, No.3, pp. 224-232, 2012 (with G. Citoni and B. Mahy). "Productivity-Wage Gaps Among Age Groups: Does the ICT Environment Matter ? ", De Economist (Netherlands Economic Review), Vol. 159, No. 2, pp. 193-221, 2011 (with A. Cataldi and S. Kampelmann). "Unemployment, Innovation and R&D", International Journal of Manpower, Vol. 29, No. 3, pp. 192-197, 2008 (with A. Garofalo and C.P. Vinci). "Overeducation on the Belgian Labour Market: Evaluation and Analysis of the Explanatory Factors Through Two Types of Approaches", Compare: A Journal of Comparative and International Education, Vol. 37, No. 4, pp. 513-532, 2007 (with R. Plasman and G. Karakaya). "Labour Contracts, Wages and Employment", International Journal of Manpower, Vol. 28, No. 7, pp. 532-538, 2007 (with C. Altavilla and B. Mahy). "HRM and Job Performance Incentives", International Journal of Manpower, Vol. 26, No. 7/8, pp. 613-618, 2005 (with B. Mahy and R. Plasman). "La dispersion salariale stimule-t-elle la performance d’une firme ? ", Problèmes économiques, La Documentation française, No. 2888 (7 décembre), pp. 29-32, 2005 (with T. Lallemand and R. Plasman). The paper above received the 2006 Emerald Literati Network Outstanding Paper Award. "Earnings Inequalities: Gender, Race and Sexual Orientation", International Journal of Manpower, Vol. 25, No. 3/4, pp. 244-250, 2004 (with D. Meulders and R. Plasman). "Competitive versus non Competitive Wage Differentials", International Journal of Manpower, Vol. 24, No. 4, pp. 328-335, 2003 (with D. Meulders and R. Plasman). "Belemmeren loonkosten de werkgelegenheid voor laaggeschoolden in België? ", Over.Werk, No. 1, pp. 84-90, 2018 (with S. Kampelmann, Y. Saks and I. Tojerow). "Is Workforce Diversity Always Performance-enhancing ? A Literature Review", Reflets et Perspectives de la vie économique, Vol. LV, No. 4, pp. 81-91, 2016 (with A. Garnero and S. Kampelmann). "La dispersion salariale augmente-t-elle l'absentéisme au sein des firmes ? ", Reflets et Perspectives de la vie économique, Vol. LV, No. 4, pp. 71-80, 2016 (with B. Mahy and M. Volral). "La responsabilité sociale des entreprises permet-elle aux travailleurs sur-éduqués d'être plus productifs ? ", Reflets et Perspectives de la vie économique, Vol. LV, No. 4, pp. 93-104, 2016 (with R. Giuliano, B. Mahy and G. Vermeylen). "Productivité et salaires des 'groupes à risque' en Belgique", Reflets et Perspectives de la vie économique, Vol. LV, No. 4, pp. 5-9, 2016 (with B. Mahy and V. Vandenberghe). "Educational Mismatch and Productivity: A Review", Dynamiques régionales, No. 1, pp. 17-26, 2014 (with B. Mahy and G. Vermeylen). "The Dynamics of Task-biased Technological Change: The Case of Occupations", Brussels Economics Review, Vol. 56, No. 2, 2013 (with S. Kampelmann). "L'emploi temporaire: une rente pour les entreprises ? ", Reflets et Perspectives de la vie économique, Vol. LI, No. 3, pp. 85-95, 2012 (with R. Giuliano and B. Mahy). "Wages of Occupations in Theory... and Practice", Reflets et Perspectives de la vie économique, Vol. L, No. 4, pp. 119-131, 2011 (with S. Kampelmann). "Pratiques dans les entreprises et marché du travail", Reflets et Perspectives de la vie économique, Vol. XLVI, No. 2/3, pp. 7-12, 2007 (with B. Mahy and R. Plasman). "Labour Market Polarization", Brussels Economic Review, Vol. 48, No. 1/2, pp. 5-11, 2005 (with B. Mahy and R. Plasman). "Economie de la demande de travail", Reflets et Perspectives de la vie économique, Vol. XLIII, No. 2, pp. 5-10, 2005 (with B. Mahy and R. Plasman). "Gender Wage Gaps: A European Perspective", Brussels Economic Review, Vol. 45, No. 2, p. 3-10, 2002 (with D. Meulders and R. Plasman). "Efficacité des politiques de réduction des cotisations de sécurité sociale", Lettre du Point d’Appui Emploi Formation, Leuven – Nivelles, 1997 (with R. Plasman). "Introduction and Overview", in D. Marsden and F. Rycx (eds. 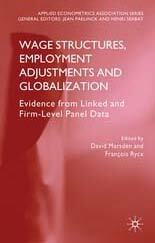 ), Wage Structures, Employment Adjustments and Globalisation: Evidence from Linked and Firm-level Panel Data, Applied Econometrices Association Series, Palgrave Macmillan, pp. 1-14, 2010. "Variability of Wages Across Sectors: How Much, Why and with What Consequences ? ", in D. Marsden and F. Rycx (eds. ), Wage Structures, Employment Adjustments and Globalisation: Evidence from Linked and Firm-level Panel Data, Applied Econometrices Association Series, Palgrave Macmillan, pp. 155-165, 2010. "Foreword", in D. Marsden and F. Rycx (eds. ), Wage Structures, Employment Adjustments and Globalisation: Evidence from Linked and Firm-level Panel Data, Applied Econometrices Association Series, Palgrave Macmillan, p. ix, 2010. "Wage Structure and Firm Productivity in Belgium", in E. Lazear et K. Shaw (eds. ), The Structure of Wages: An International Comparison, NBER and University of Chicago Press, pp. 179-215, 2009 (with T. Lallemand and R. Plasman). Also published as NBER Working Paper, No. 12978, March 2007. This book is listed as Noteworthy Book in Industrial Relations and Labor Economics for 2009 by the Industrial Relations Section at Princeton University. "Can Rent Sharing Explain the Belgian Gender Wage Gap ? ", in H. Bunzel, B. Christensen, G. Neumann and J.-M. Robin (eds. ), Structural Models of Wage and Employment Dynamics, Contributions to Economic Analysis Series, Vol. 275, Elsevier North-Holland, pp. 413-439, 2006 (with I. Tojerow). This book contains a selection of papers presented at a conference in Denmark (Sonderborg, August 15-18, 2004) on "Labour Market Models and Matched Employer-Employee Data" held in honour of Dale Mortensen (the 2010 Nobel Prize laureate) upon the occasion of his 65th birthday. "The Gender Wage Gap in Belgium: How Much Do Sectors Matter ? ", in B. Mahy, R. Plasman and F. Rycx (eds. 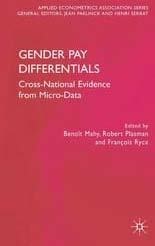 ), Gender Pay Differentials: Cross-National Evidence from Micro-Data, Applied Econometrics Association Series, Palgrave Macmillan, pp. 99-117, 2006 (with I. Tojerow). "Gender Pay Differentials: Cross-National Evidence from Micro-Data. Introduction and Overview", in B. Mahy, R. Plasman and F. Rycx (eds. ), Gender Pay Differentials: Cross-National Evidence from Micro-Data, Applied Econometrics Association Series, Palgrave Macmillan, pp. 1-9, 2006 (with B. Mahy and R. Plasman). 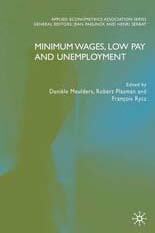 "Minimum Wages, Low Pay and Unemployment - Introduction", in D. Meulders, R. Plasman and F. Rycx (eds. ), Minimum Wages, Low Pay and Unemployment, Applied Econometrices Association Series, Palgrave Macmillan, xi-xiv, 2004 (with D. Meulders and R. Plasman). Négociations collectives, performances macro-économiques et pauvreté : une perspective internationale", in A. Martens, G. Van Gyes and P. van der Hallen (eds. ), Le mouvement syndical à la veille du 21 ème siècle, SSTC-DWTC, pp. 39-48, 2002 (with R. Plasman). "Coût relatif et emploi: une synthèse", in Rapport de la Commission 2 du XIIème Congrès des Economistes Belges de Langue Française, CIFOP, Charleroi, pp. 305-326, 1996 (with R. Plasman). Title: Collective Bargaining, Labour Market Performance, Wage Structures and Poverty: An International Perspective. Supervisor, Members of the Jury: R. Plasman (ULB), C. Croux (ULB), C. Lucifora (Università Cattolica de Milano), D. Marsden (London School of Economics), D. Meulders (ULB) and K. Sekkat (ULB). Alexandre Warocquier: "Essays in Labour Economics", jointly supervised with M. Volral (UMons). Nicola Gagliardi: "Essays in Labour & International Economics". Valentine Fays: "Essays in Labour Economics & Migration", jointly supervised (co-tutelle) with B. Mahy (UMons). Valentine Jacobs: "Essays in Labour & Education Economics", jointly supervised (co-tutelle) with B. Mahy (UMons). Guillaume Perilleux: "Essays on Household Finance and Consumption", jointly supervised with Bram De Rock (ULB). Céline Piton: "Essays in Labour Economics & Migration". Alkistis Zavakou: "How Institutions Affect the Effectiveness of Labour Market Policies? ", jointly supervised with Hans-Peter Blossfeld at the European University Institute, Florence, Italy. Other members of the jury: A. Hamerijck (European University Institute) and Emmanuel Matsaganis (Università Politecnico di Milano). Ph.D. awarded on February 22, 2019. Romina Giuliano: "Temporary Employment, Firm Performance and Job Satisfaction", jointly supervised with B. Mahy at the University of Mons (Belgium). Other members of the jury: I. Terraz (Université de Strasbourg, France), M. Jepsen (ETUI and ULB), M. Labie (UMons) and M. Volral (UMons). Ph.D. awarded on June 27, 2017. Guillaume Vermeylen: "The Impact of Educational Mismatch on Firm Productivity, Wages and Productivity-Wage Gaps in Different Working Environments", jointly supervised (co-tutelle) with B. Mahy at the University of Mons (Belgium). Other members of the jury: Seamus McGuinness (Economic and Social Research Institute, Ireland), S. O'Dorchai (ULB), G. Pagano (UMons), I. Tojerow (ULB) and M. Volral (UMons). Ph.D. awarded on September 22, 2016. Andrea Garnero: "Institutions and Heterogeneity in the Labour Market", jointly supervised (co-tutelle) with P. Askenazy at Ecole Normale Supérieure (ENS), Paris. Other members of the jury: A. Clark (CNRS, Paris School of Economics), M. Jepsen (ETUI), D. Meurs (Université Paris Ouest - Nanterre La Défense), I. Tojerow (ULB). Ph.D. awarded on January 16, 2015. Bernhard Michel: "Economic and Environmental Causes and Consequences of Offshoring: An Empirical Assessment", ULB. Other members of the jury: J. Konings (KULeuven), C. Peeters (ULB), R. Plasman (ULB), G. Rayp (Universiteit Gent). Ph.D. awarded on June 19, 2014. Alessandra Cataldi: "Essays on the Evolution of Productivity and Wages", jointly supervised M. Corsi at the University of Rome - La Sapienza (Italy). Other members of the jury: F. Bettio (University of Sienna), G. Vallanti (University LUISS 'Guido Carli') and S. De Stefanis (University of Milan). Ph.D. awarded on December 5, 2012. Stephan Kampelmann: "The Socio-Economics of Pay Rules", jointly supervised with F. Jany-Catrice at the University of Lille 1 (France). Other members of the jury: M. Gross (Humbold University), F. Legendre (Univerity of Paris-Est), David Marsden (LSE) and S. O'Dorchai (ULB). Ph.D. awarded on May 20, 2011. Mélanie Volral: "Pratiques salariales, formation et performance de productivité et d'emploi dans les entreprises belges: une approche micro-économétrique", jointly supervised with B. Mahy at the University of Mons (Belgium). Other members of the jury: S. Roux (ENSAE), E. Dhyne (U Mons), G. Pagano (U Mons)). Ph.D. awarded on September 17, 2010. Michael Rusinek: “Wages and the Bargaining Regimes in Corporatist Countries. A Series of Empirical Essays”, jointly supervised with R. Plasman at the ULB. Other members of the Jury: C. Dell'Aringa (Università Cattolica de Milano), H. Simon (Universidad de Alicante), M. Jepsen (ULB), M. Verstraeten (ULB). Ph.D. awardedon June 17, 2009. Ilan Tojerow: “Industry Wage Differentials, Rent-Sharing and Gender: Three Empirical Essays”, jointly supervised with R. Plasman at the ULB. Other members of the Jury: S. Roux (ENSAE), B. Mahy (U Mons), D. Meulders (ULB) and M. Jepsen (ULB). Ph.D. awarded on April 21, 2008. Thierry Lallemand: “Pay Inequality and Economic Performance: Three Empirical Essays”, jointly supervised with R. Plasman at the ULB. Other members of the Jury: T. Eriksson (Aarhus School of Business), B. Mahy (U Mons) and M. Jepsen (ULB). Ph.D. awarded on June 22, 2006. Member of the Editorial Advisory Board of the International Journal of Manpower. Since March 2008. Co-Editor of the Brussels Economic Review. January 2011 - June 2017. Member of the Editorial Board of the Brussels Economic Review. January 2003 - December 2010. Referee Service for: British Journal of industrial Relations, Brussels Economic Review, Empirical Economics, European Economic Review, European Journal of Industrial Relations, European Central Bank Working Paper Series, Labour Economics, Louvain Economic Review, Industrial and Labor Relations Review, Industrial Relations: A Journal of Economy and Society, Industrial Relations Journal, International Journal of Manpower, Journal of Financial Stability, Journal of Economic Inequality, Journal of Industrial Economics, Journal of Population Economics, Journal of the European Economic Association, National Bank of Belgium Working Paper Series, Research in Labor Economics, Review of Income and Wealth, Scottish Journal of Political Economy, Socio-Economic Review, The World Economy, The Manchester School.